Chairman of the Board Hansueli Loosli and CEO Urs Schaeppi review 2012 and take a look at what 2013 will bring. What Swisscom expects of business development over the next year. 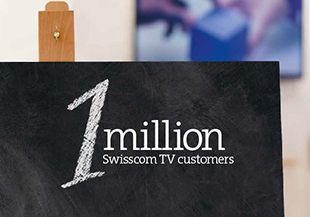 Thanks to record growth in the last year, Swisscom TV now has 1 million customers. 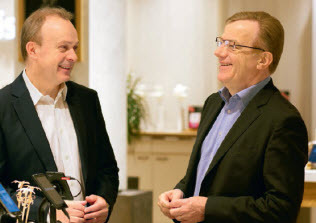 Swisscom takes responsibility seriously – now and in the future. To this end, it relies on the corporate responsibility strategy (CR strategy) with its four strategic priorities. In 2013 Swisscom posted this operating income before depreciation and amortisation (EBITDA). 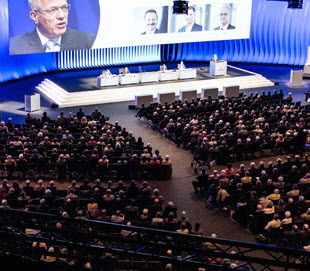 Operating income (EBIT) in 2013: CHF 2.3 billion. Facts & figures for the 2013 financial year. 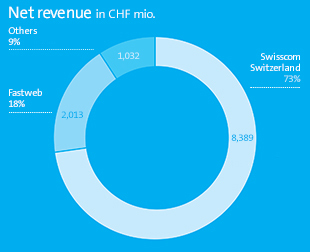 Swisscom Ltd recorded net income of CHF 1,695 million in 2013. The currently applicable Guidelines "GRI 3.1" of the Global Reporting Initiative determine the scope and content of the Sustainability Reporting. These guidelines form the world's leading standard for corporate sustainability reporting. SGS has verified and confirmed that the 2013 Annual Report corresponds with the application level A + of the 'GRI 3.1 guidelines'. The Annual General Meeting will be held on this date. Remuneration parid to the Board of Directors and the Group Executive Board in 2013. Group key performance indicators in the last financial year.